Education:  E.P.F.L. Chemical Engineer, Phd (Docteur d’ Etat es Ssciences) on Oil & Gas Production, I.F.P. Petroleum Economics &  Greek Eisenhower Fellow (on Oil Exploration & Production & Energy). 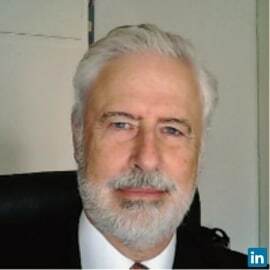 Dr. Elias Konofagos is actually working as Executive Vice President of FLOW Energy S.A. providing between others high level E&P consulting services. He started his career with Elf Acquitaine (North Sea Heimdal Gas Field Development), then joined Successively Mobil North Sea in Stavanger (Statfjord-B Oil & Gas Field), Public Petroleum Corporation of Greece S.A. (Supervision of Prinos Oil Field & South Kavala Gas Field Developmets), Public Petroleum Corporation Exploration & Production S.A. (Execution of the First Licensing Round in Greece), Hellenic Petroleum S.A. (acting as international E&P General Director). He has an extensive Worldwide Oil & Gas Exploration-Production experience in Managing E&P assets, creating Value & improving business performance. Planning and Executing extensive exploration campaigns in Greece (Geological, Geophysical, Drilling, interpretation of Production Tests, Technical & Economical Evaluations of expected hydrocarbons Deposits). Exploration concerned a total of 54.000 km2 offshore and onshore blocks that leaded to 2 discoveries, West Katakolon Offshore Oil Field and the Epanomi Gas Field. As Company Representative participated in Executive Consortium Exploration Committees for the exploration of four offshore & Onshore blocks in Western Greece. Committees were part of Joint Operating Agreements related with Companies as Triton International, Entreprise Oil, Mol & Union Texas. For several years responsible for the acquisition of interests and participation in exploration and production projects abroad. This allowed Strategy establishment, Planning and Management conduction of Exploration and Production operations in Offshore and Offshore Concession Blocks operated with International Consortia, in geographical areas located in Libya, Egypt, United Arab Emirates, Montenegro, Albania, Russia, Azerbaizan Kazakhstan, North Sea etc. Joint Ventures participations concerned mainly Hellenic Petroleum with Companies as OMV, Ramco, OilSearch, Woodside, Repsol, Melrose etc. Monitoring and supervising -on behalf of the Greek State National Company- of the North Aegean Oil & Gas offshore fields Development (installation & operation of Prinos Oil Field & South Kavala Gas Field drilling platforms and production platforms). Created several data Rooms in Greece for the Execution of the Greek Licensing rounds. Participated also in several Foreign Data Rooms & Licencing Rounds. Participated and Executed more than 100 asset evaluations studies as well as Feasibility Studies related to Exploration & Production assets. International Association of Energy Economics (Ι. Α. Ε. Ε. ).